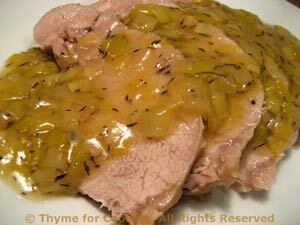 Braised Pork with Leek Sauce, easy gourmet dinner recipes. Pork loin roast gets meltingly tender when slowly braised. The leeks add a slightly sweet flavor, not as strong as onions and are at the height of their season now. Braising does wonderful things to a pork roast: keeping it moist and making it very tender. This is served with a White Wine and Leek Sauce. 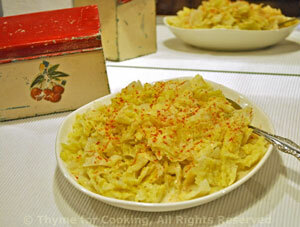 Creamed cabbage - sounds terribly old-fashioned, doesn't it? I've updated it a bit.... But it's still simple. Remove dark green outer leaves from cabbage. Cut off a thick slice, avoiding the core. 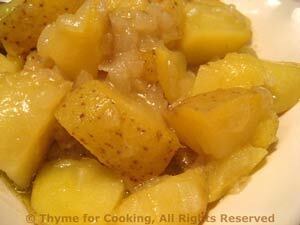 Lay flat, cut into 3 or 4 wedges, then thinly slice the wedges. Put the cabbage and chicken stock in a medium skillet. Cover and braise until cabbage is tender, about 15 minutes. Stir in yogurt, sprinkle with paprika and serve.